paradise and look like your passport photo. Passports are required for everyone who wants to fly internationally. “Everyone” means everyone, infants too. “Internationally” also means between the US and any other country – even Canada and the Caribbean islands that used to require only a driver’s license. This also means that everyone who wants to get back into the US must have a passport! Remember that a child’s passport is valid for only five years and will expire five years earlier than an adult passport issued at the same time. It is less expensive to renew an expired passport within fifteen years of its original issue date, so it pays (literally) to keep track of expiration dates. 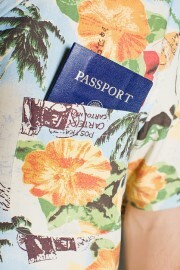 When you plan a trip make sure your passport is valid for at least six months beyond your travel dates. Many countries require this cushion of time as they do not want you to become stranded in their country with no legal status. They might also require you to prove that you have plans for moving along to some other country; a return ticket can suffice there. The standards and processes for obtaining visas vary from invisible to very challenging. Some countries (China and Brazil) require a multipage application to be submitted through their embassy or consulate along with your passport and a significant fee. Other countries will let you obtain a visa upon arrival (Cambodia) or as part of your airline ticket (Australia). It is best to consult the embassy of any country you will be visiting about whether you will need a visa and how to get it. It is their country and their rules make the determination. Reciprocity Fee – A few countries have eliminated the paperwork and just settled for the money available from arriving travelers. They have instituted a Reciprocity Fee with a value equal to what your government charges their citizens for a visa. Both Argentina and Chile charge US citizens $160 upon arrival at their airports. The Argentine fee is valid for multiple visits for ten years, but Chile’s only for ninety days. Any international trip requires that you check the condition of your passport and find out whether any countries in your itinerary will have special requirements. Unless you have dealt with those questions, you won’t even get on the plane. US citizens can visit this website for much more information: www.travel.state.gov . With proper documentation, you can go anywhere! This entry was posted in Travel, Uncategorized and tagged passport, reciprocity fee, travel, Visa. Bookmark the permalink.